This week was weird. Even by our normally pretty high standards of odd, this was right up there. 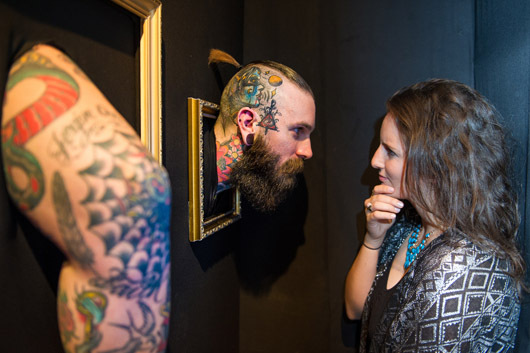 Picture yourself standing in the Riflemaker Gallery on Beak Street sipping a rum and ginger as about 150 people jostle to have a chat with a semi-naked man with the tattoo of a pretty complete skeleton across the entirety of their body. Then multiply that up by four people – all “wearing” some of the world’s finest tattoo work – standing in gilt framed coffins on the ground floor and around ten more thrusting various inked body parts through especially constructed frames on the first floor. Just like I said, odd. 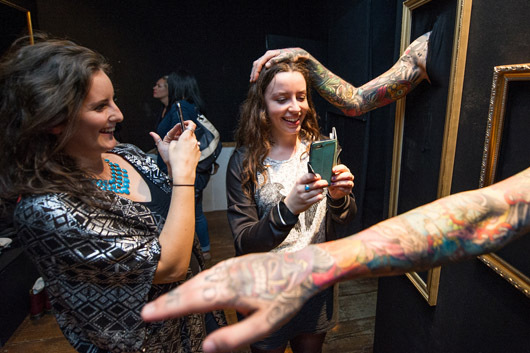 All of this was in aid of launching the brilliant Ink Master on truTV this Wednesday. The Great British Bake Off with tats not tatts and ink rather than icing, it’s a fantastic watch. Working with amazing tattoo talent that we sourced in the UK – Lal Hardy and Cally-Jo – the gallery was the result of a formidable team effort with Gav and Ellen leading the charge. Top grade work from the team and another piece of work that’ll go down as a triumph in Hope&Glory history.